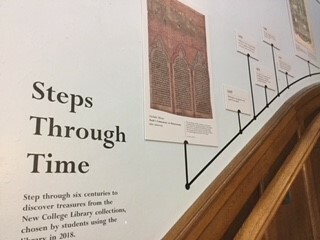 Have you seen the new Steps Through Time display at New College Library? Today we’re celebrating the Steps Through Time project, which developed six display panels to be mounted alongside the steps up into New College Library. 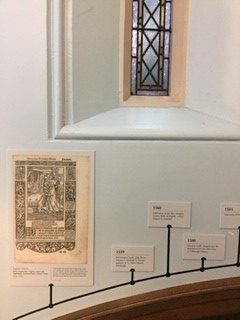 These panels highlight treasures from New College Library’s rare book and archive collections against a timeline of Scottish and religious history. This project kicked off with a student engagement event between Monday 23 to Wednesday 25 April. We held a daily display of New College Special Collections items featuring items from two different centuries each day, and encouraged students to take a few minutes break from their revision to vote on their favourite items from each century. Over the three days we had nearly 120 visitors to our displays, many of whom commented that they had no idea that New College Library held Special Collections items like these. I’m grateful to my two volunteers, Nastassja Alfonso and Jessica Wilkinson, for helping with these events and persuading revising students that they really did want to look at some Special Collections. The item that gathered the most votes was the 1638 National Covenant (bequeathed by Thomas Guthrie), which is one of five National Covenants in the New College Library collections. The National Covenants have recently returned to New College Library after benefiting from conservation work and digital photography at the CRC. A key task was the selection of the images, which we did with the data gathered from students votes, but also by consulting with student representatives from the School of Divinity. A clear message about representing diversity in our text and image choices was received from the student community and so we aimed to curate diversity into the timeline narrative. Student engagement transformed the project into more than developing some display panels of library treasures. If we had planned just to do that, the panels would have included images of incunabula, Bibles or Luther pamphlets, some of New College’s collection strengths. But that was not the story that the student community wanted to tell. We hope the project will improve an area of the library entrance which is used by all visitors to the library, and that it will raise the profile of New College Library’s unique Special Collections. We will be gathering feedback both over the summer and in the first few weeks of semester to better understand the impact of the Steps Through Time display. Today the School of Divinity will mark 500 years since Martin Luther nailed the Ninety Five Theses to the door of Wittemberg Church with a public lecture from Durham University’s Professor Alec Ryrie, a leading scholar of Reformation History, who will speak on ‘Protestants and their Bibles from the Reformation to the Present’. Over this summer, our three student interns, Thomas, Holly and Mila have been hard at work behind the scenes in New College Library’s Stack III. Their task was to work with the X Collection, a collection of large (folio) early printed books. Over the years this collection had gathered a layer of dust, which our interns carefully removed with a museum book hoover. Having our interns handling each of these books was also a great opportunity to learn more about them, and to understand how the collection was composed in terms of date, language and place of publication. These details were logged using methodology adapted from projects on collections in National Trust Houses. We’re delighted to say that that our interns have tackled three full bays of the X Collection, and cleaned and logged over 1600 books. We now know that the collection (as logged so far) is almost entirely pre-1800 in date, predominantly in English and Latin and pretty equally split between European and UK imprints. All this information will help us to develop future projects to catalogue this collection online. It was a pleasure to work with our student interns, and through their enthusiasm to rediscover these collections. Hope to do it all again next year! Christine Love-Rodgers, Academic Support Librarian – Divinity. 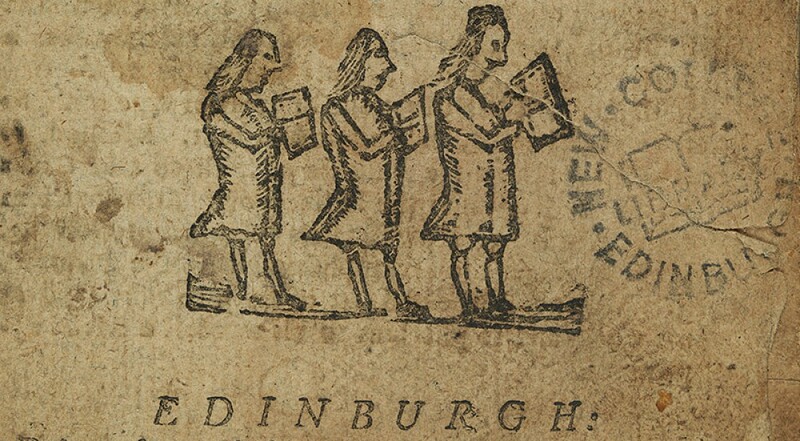 This week New College welcomes the British Association for Jewish Studies Conference to Edinburgh. Delegates are welcome to visit New College Library where they’ll find a display of Jewish Studies related items from our Special Collections.. 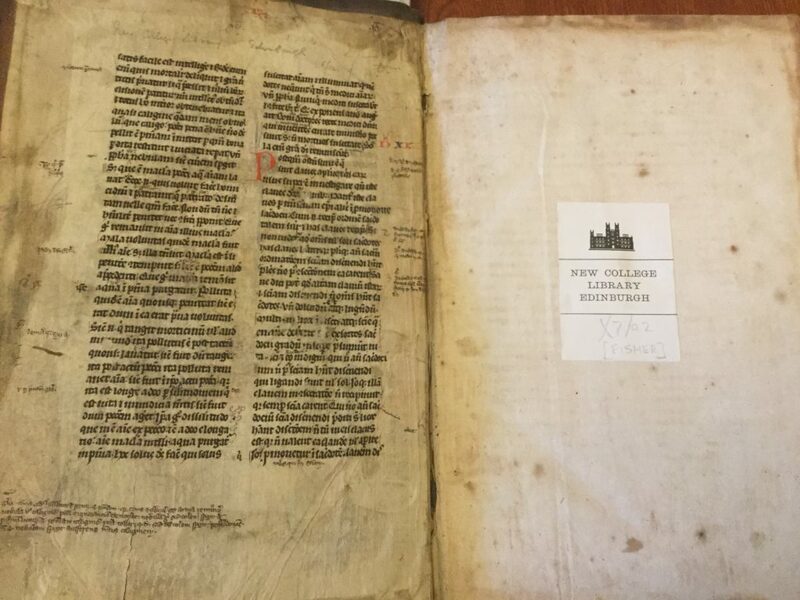 Early Jewish sacred texts, biblical scholarship and devotional works in Hebrew can be discovered throughout New College Library’s Special Collections. leha-Rav rabenu Mosheh bar Naḥman. Perush ha-Torah. Pisa: Bene Sontsino, 1514. Dal-Chr 15. 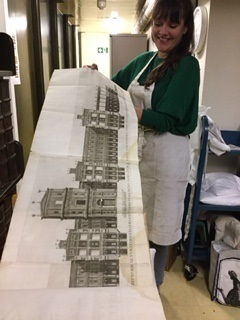 A really good question was asked by one of our student interns recently about the rare books collections they were working with : “Why are the big books so big?”. This set me thinking about the size of the books in our Special Collections, big and small, and why size matters. The biggest book that I know in our collections is the Queen’s Bible, which is so large (48cm in height) and heavy it takes two members of staff to safely handle it. This Bible was prepared for the International Exhibition of 1862, at which it was an example of the new technology of using machinery for composing text, though the printing was done by hand. 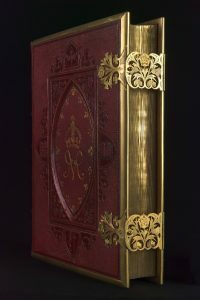 With only 170 copies published, it is bound in red morocco, embossed with royal cipher and other ornaments, with brass mountings and clasps. For this book, its size is all about impressing the onlooker and is part of its role as a luxury object. Alongside this book, in our early Bibles collection we have several examples of pulpit Bibles such as this Geneva Bible used as the pulpit Bible in Crail, Fife. Traditionally Presbyterian churches in Scotland had a centrally located pulpit, reflecting the importance of the Bible as the foundation of faith. The large size of the book is part of its role as an object used in public worship. 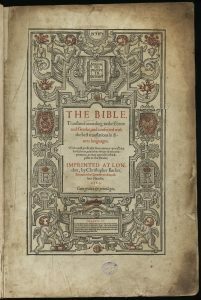 In fact many of the largest books in our rare book collections are Bibles, and this is no surprise considering that the Bible is a very large amount of text, which requires a large book to fit it all in. This is even more the case for polyglot Bibles, which offer parallel versions of the text in different languages such as Latin, Hebrew and Greek, or for Bible versions that include commentary parallel with the text. 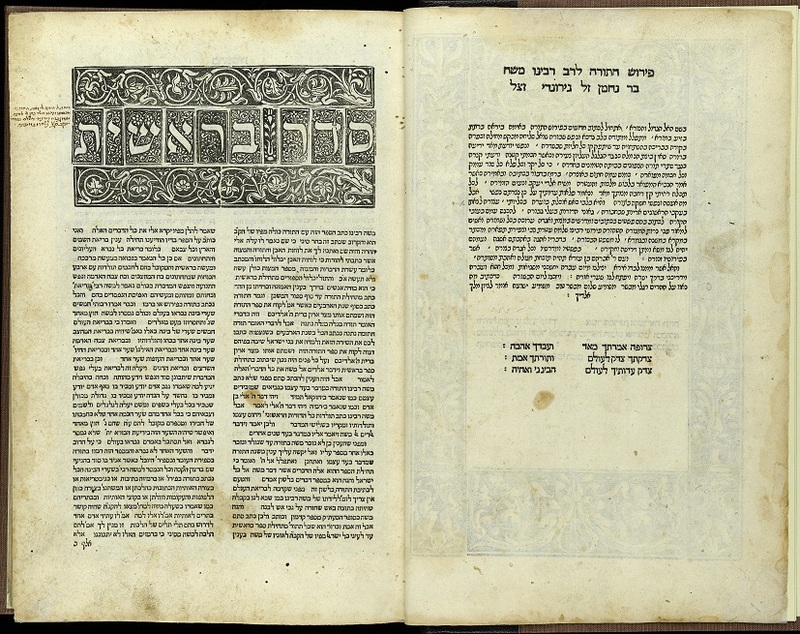 In the recently catalogued LP section, this folio edition of the complete Hebrew Bible, with Latin translation, and Latin commentary drawn from Rabbinic sources, is one of the greatest Christian Hebraists of the sixteenth century, Sebastian Münster. 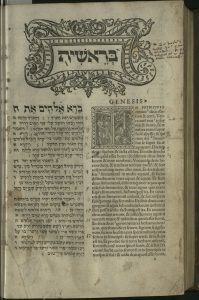 This Bible was highly valued by 16th century Christian students of the Hebrew language and the Hebrew Scriptures, and is likely to have been among the resources used by Luther in preparing his Genesis lectures (1535-1545), his last major work. With thanks to Janice Gailani, Rare Books Cataloguer. 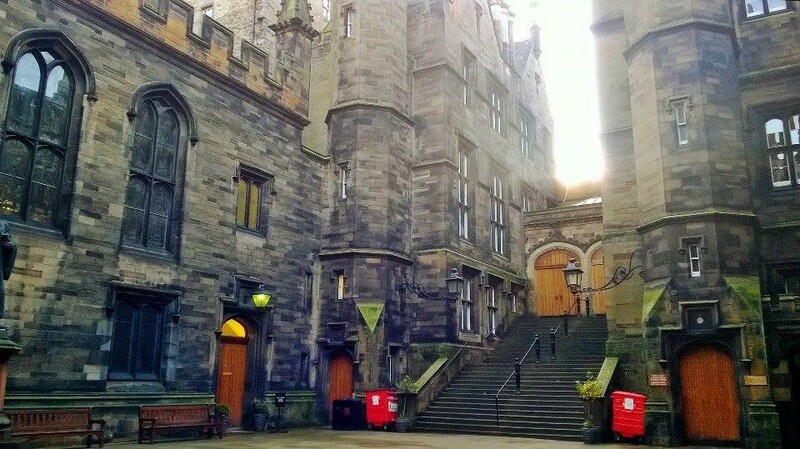 As part of the Master’s degree in Book History and Material Culture at the University of Edinburgh, each student is required to undertake a ten-week work placement at a cultural heritage institution. I have long focused my academic interest upon aspects of divinity, especially liturgical and devotional texts, and as such, it was a pleasure to learn that my placement would be at New College Library. Now, with just one workday left until the placement’s end, I am taking the opportunity to reflect upon my time here – the treasures found, tasks undertaken, and skills learnt. The projects I’ve been working on fall into roughly three areas: collections assessment, collections care, and exhibitions. I’ve handled several different collections, including the Chinese collection donated to New College Library in 1921 by the Rev. James W. Inglis, the Portraits collection from the New College archives, and the Norman Walker Porteous Papers. I’ve also been working with a sequence of very dusty unaccessioned material and a sequence of uncatalogued pre-1800 books. I was on the lookout for any items with copy-specific features and/or interesting provenance that could heighten potential research value. Collections care is another important factor in library management, and when handling each item I would assess its condition, making a note of particularly bad damage and tying any fragile items with cotton conservation tape. 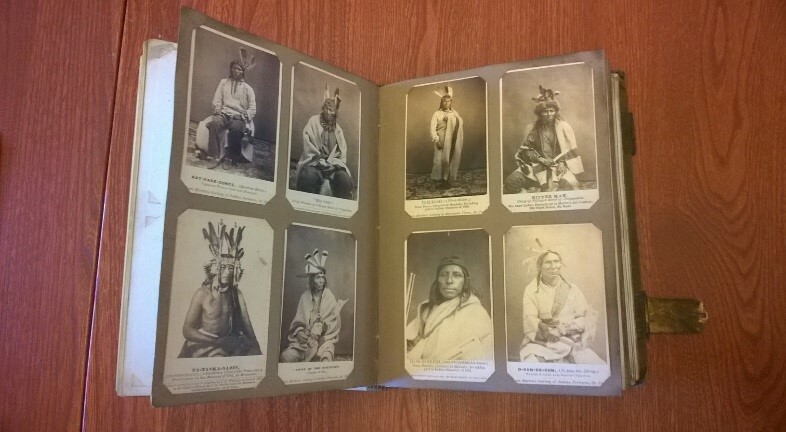 One particularly interesting item I came across was a photo album collected by Bishop Whipple from Minnesota. 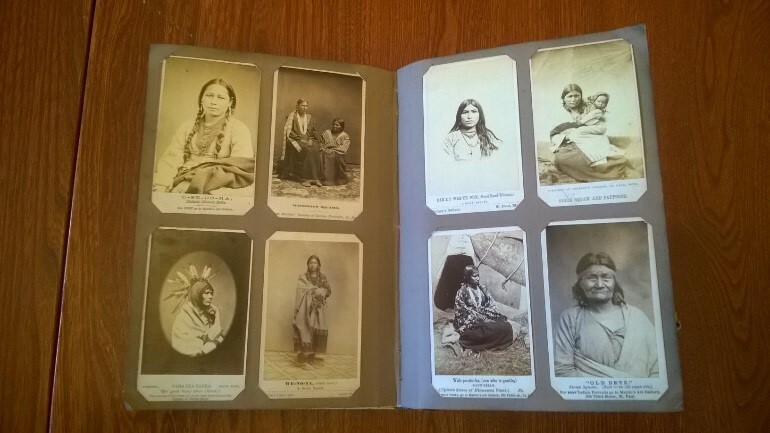 After spending most of the day sifting through albums of British ministers and notable men, it was a surprise to encounter portraits of nineteenth-century North American Indians! Anyone who has visited the library will be able to understand why my romantic sentiments were only encouraged by the stunning neo-gothic building that is New College. However, as the placement progressed, I came to realise the problem with my original perspective: not only was it impractical, it was selfish. My bibliophilic daydream made room for me only, hoarding rare books like a dragon with its gold, when the true importance of cultural heritage lies in it being openly accessible to all. 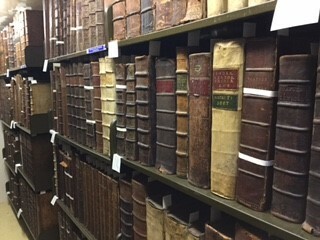 Enabling public access to special collections can generate significant environmental, economic and social benefits: it boosts the economy, aids social inclusion and cohesion, advances understanding and education, and can even contribute to wider agendas such as health outcomes, the environment, and urban planning. The importance of cultural heritage to humanity is perhaps recognised most clearly through its destruction. Consider ISIL’s treatment of Palmyra and Mosul, or the Taliban’s destruction of the Buddhas of Bamiyan in Afghanistan in 2001 – both attempts to destroy a community’s sense of shared history and identity. However, heritage is mostly lost not by wilful destruction but by simple neglect, demonstrating the constant need for good collections care and management. Any loss of heritage highlights not only its importance but also its irreplaceability. This, I have come to realise, is one of the clearest arguments for the importance of collections care and management as a profession: preserving our history to pass on to future generations. I would like to thank Christine Love-Rodgers, and all of the staff at New College Library, for allowing me to see behind the scenes and get to grips with the everyday tasks that ensure these collections can be accessed, enjoyed, and preserved. Gone are my fantasies of green leather-topped desks, lamplight, and spending every day surrounded by mountains of fifteenth-century manuscripts, but I have found the reality that has replaced these daydreams to be just as exciting. Philipp Melanchthon (1497-1560) was born on 16 February 1497, to become a Greek scholar and Protestant theologian, and a powerful force in Reformation debate. New College Library’s collections provide a rich resource for and about Reformation theology and its readers. One of these readers was John Fisher [St John Fisher] (c.1469–1535), bishop of Rochester, cardinal, and martyr in the time of Henry VII and VIII. Tutored in Greek by Erasmus, Fisher was able to use Erasmus’s edition of the Greek New Testament (1). Like his contemporary, Thomas More, Fisher was an active opponent of Martin Luther in the theological debates of the 1520s. 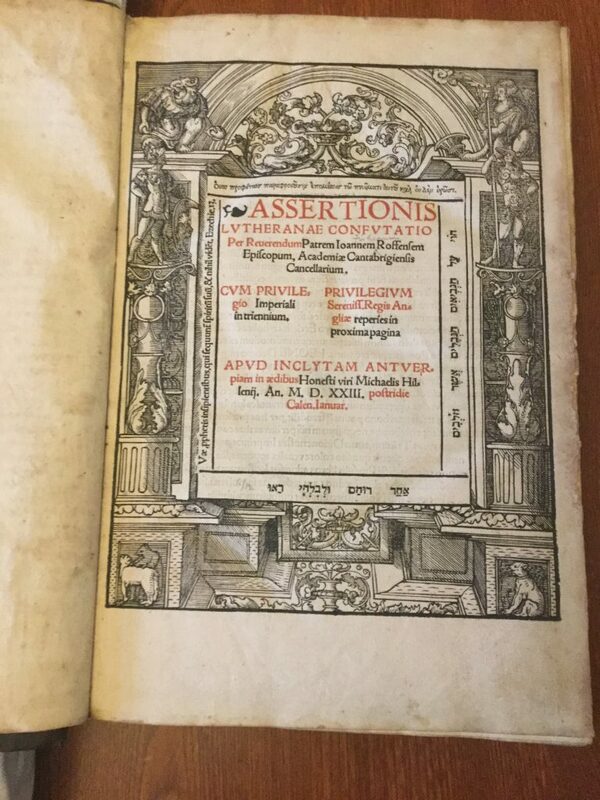 New College Library holds two editions of Fisher’s response to Luther’s theology, Assertionis Lutheranae confutatio (1523). On 14, 15 and 16 February 2017, the Cunningham Lectures at New College will mark the 500th Luther anniversary, with lectures by Professor Kaufmann covering Europe, Reformation and Luther. New College Library holds outstanding Reformation collections that support the theme of the first lecture, Book, Print and Reformation. 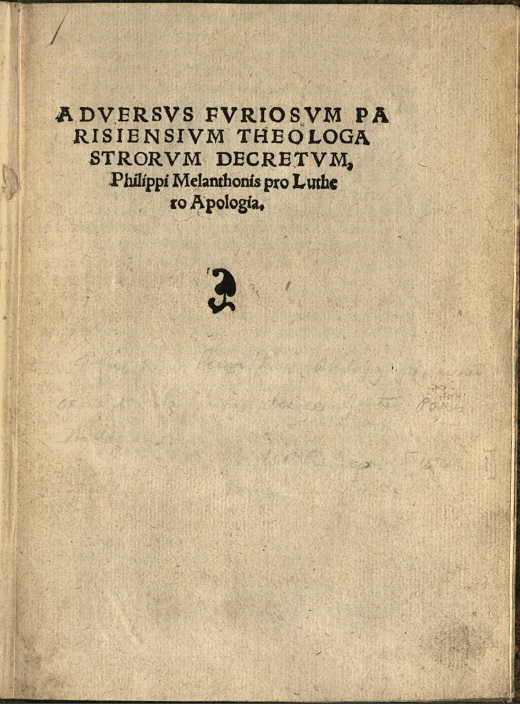 This includes examples of Luther’s pamphlets like the one below, from the early part of his career at the University of Wittenberg. 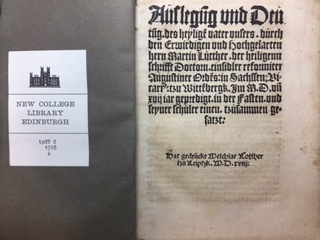 One of the current Special Collections cataloguing projects at New College Library is the W4/5 section which includes works on ecclesiastical history and theology. 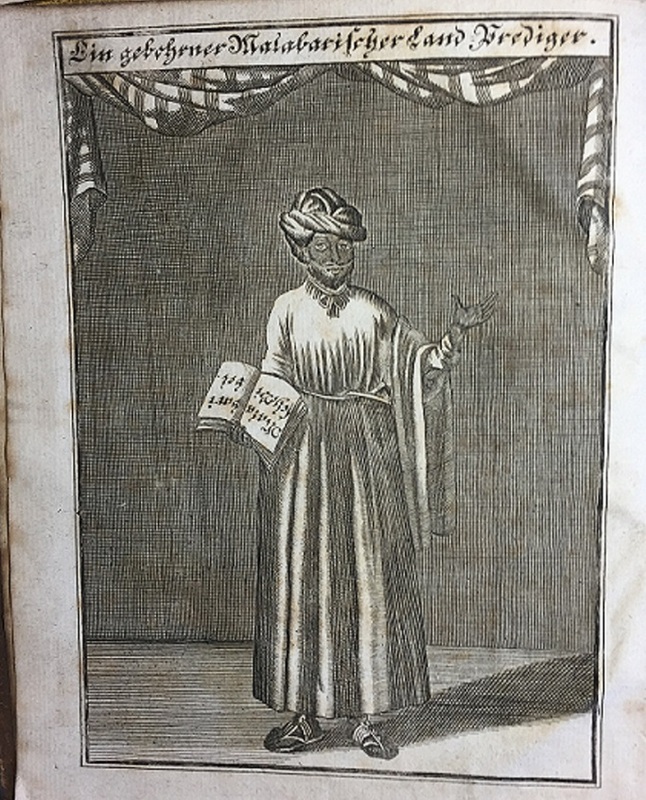 In this collection we were pleased to discover three volumes of the Halle reports, a Protestant missionary magazine from a Danish mission to India in the eighteenth century.